(Phys.org)—A group of US researchers studying some of the oldest rocks in the world in the Pilbara region of Western Australia, say they have found the oldest traces of life on Earth, dated at 3.49 billion years old. The scientists, led by Associate Professor Nora Noffke of the Old Dominion University in Norfolk, Virginia, did not strictly find fossils of that age, but actually found web-like patterns criss-crossing the surfaces of the Pilbara sandstone. Dr. Noffke calls the patterns and textures Microbially Induced Sedimentary Structures (MISS) and said the structures were created by a complete ecosystem of different types of bacteria living in the Archean eon (roughly 3.8 to 2.5 GA) almost three-and-a-half billion years ago. The Pilbara region is a popular area for scientists searching for traces of early life on the planet because the ancient sedimentary rocks are extremely well preserved. The rocks were originally sand, and the region was originally a coastal plain. The sand was then built up into microbial mats by microbes, and over time the sand turned to rock and preserved the bacterial mats and structures such as MISS. A separate group of scientists working in the Pilbara published a paper last year describing their find of microbial fossil traces dated at around 3.4 billion years old. Similar fossils have also been found by Noffke's group in sedimentary rocks in South Africa, but these were dated at 2.9 billion years old. Noffke's team measured the carbon content in the rock and examined the ratio of carbon-13 to carbon-12. In non-living sources the ratio is around 1:99, while in photosynthesizing bacteria and other living organisms there is even less C13. Noffke and her group found the ratio in their samples was consistent with organic carbon. Unfortunately, there were no traces of preserved fats, proteins or fossilized microbes to definitely confirm the material is from living organisms. Microbial mats still form today in a few places such as the Pilbara. They contain mats of photosynthesizing cyanobacteria that produce food for use by themselves and other bacteria in the mat, and they also produce oxygen through photosynthesis. Cyanobacteria are believed to have created the Earth's oxygen around 2.4 billion years ago. Dr. Noffke said her findings could help in the search for signs of early life on other planets, by giving more information on what to look for, as explained in an earlier Phys.Org article. Dr. Noffke presented the paper at the annual meeting of the Geological Society of America in Charlotte, North Carolina in November. Gerald Friedman's actualistic research on microbial processes in modern coastal sabkhas has opened the path of understanding of ancient microbial biota. Some of Earth's oldest sedimentary rocks exposed in the Pilbara area of Western Australia include a mixed carbonate-evaporite-siliciclastic coastal sabkha. In the present day such sabkhas are widely colonized by microbial mats. Interacting with sedimentary processes such as erosion or evaporate crystal growth the microbial mats generate biogenic structures such as stromatolites or MISS. In the Pilbara area of Western Australia stromatolites occur which belong to the oldest fossils in Earth history. However, there also exists a plethora of well preserved MISS. These structures represent an entire ecosystem of surprising diversity. Actualistic comparison of fossil and modern biogenic structures and their facies-related distribution in sabkha settings points towards the presence of microbial communities in the Paleoarchean time highly similar to those we are familiar with today. I hope these rocks aren't in the way of mineral exploration, our record in Australia of preserving the ancient landscape is woeful. Greed rules here. I think it's just amazing to consider that these forms of life have been around for a fifth to a quarter of the age of the universe (and that anything recognizeable about them could be preserved over such an enormously long time). That is amazing, thank you for providing that insight. That puts my comment into some sort of perspective when mining interests just think of the "now" and what the CEOs can do for shareholders during their tenure, nothing about environmental preservation. Take one good look at these fossils, they may not be here much longer. This also might provide more guidance on structures to look for in Mars rocks and sedimentary layers. It also begs the question, if cyanobacteria created earths oxygen so long ago, wouldn't it also be correct to infer that since there isn't oxygen on Mars, that no such life started there too? Or could the peroxides in Mars soil be evidence that it did, then was extinguished. Rusting/oxidizing iron consumes a lot of oxygen. I can't believe it. All interesting comments excepting lurker's. @Anda - Even Lurker's comment is accurate and on topic. @alg131 - On earth it took oceans full of cyanobacteria roughly a billion years to release enough oxygen to give earth an oxygen-rich atmostphere, and much of the early oxygen did indeed go into oxidizing iron. Hence even if it were found that Mars never had much oxygen in its atmosphere, it would not be a strong argument against life, just an argument against enormous quantities of photosynthetic life. Sounds promising, even for a conference proceeding. Sabkhas are salt flats, and early atmosphere wouldn't protect from UV. 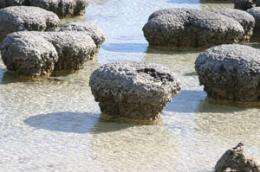 But as for early stromatolites the modern biotopes should be prototype systems for deep sea bacterial mat communities ("sedimentary processes such as erosion"). @alg131: Cyanobacteria and their oxygenating photosynthesis is very derived. It is an open question if these systems were even phototrophic, and if they were if they already were using oxygen as electron sink. There were a lot of iron and sulfur around for that, and early banded iron formations could be either be abiotically produced or produced by photoferrotroph bacteria. "These microbes live at a depth where light levels are between 0.005 and 0.01 percent what they are at the lake's surface, says Crowe. Yet the organisms thrive: Each liter of water there contains between 300 million and 16 billion of the photoferrotrophs, the researchers estimate. Those microbes live in the anoxic sweet spot where dissolved iron and phosphorus rising from the depths meet the weak-yet-usable sunlight filtering down from above. Their rate of growth creates just as much biomass —about 650 nanograms of carbon per hour in each liter of water —as photosynthetic organisms at the lake's surface do." "One of the biggest mysteries about banded iron formations is what caused the alternating layers of iron-rich and silica-rich strata, which can range anywhere from a few micrometers to a few meters thick." "The team measured the rates at which several photoferrotroph types oxidized dissolved iron at various temperatures in anoxic, silica-rich water samples. For all of the microbes tested, oxidation rates increased as water temperature rose from 5° Celsius to 25°C. At temperatures of 30°C and higher, oxidation rates dropped substantially. When the water temperature rose to 55°C, the photoferrotrophs continued to oxidize iron but were eventually incapacitated: Even after temperature returned to 25°C, the microbes had stopped oxidizing iron and didn't restart. Similarly, the microbes probably wouldn't survive prolonged exposure to waters spewing from hydrothermal vents or volcanic seamounts. While iron oxidation caused iron-rich minerals to drop out of solution as water temperatures rose from 5°C to 25°C, the precipitation of silica showed exactly the opposite trend,". Hence the observed seasonal bands. considering what we now understand about life, and about the prevalence of planets in the universe, it's almost a statistical certainty that some form(s) of life exist out there in the universe. Most people disagree with me when I say that I do not think it will be a big revolutionary moment for mankind when we discover the equivalent of bacterial life ( or the remnants of it) on a another planet, or moon of a planet---possibly within our own solar system. the real REAL question, is whether we will discover MULTICELLULAR life or if we discover one or another forms of complex life . just to find simple bacteria , even a large bio-mass amount of it, isn't really that big of a deal. life is sort of a self organizing principal of non-living matter. then of course, there is the real BIG ONE> when/if we discover Intelligent Life. that is another question altogether. if life is over 3 billion years old, perhaps there have come and gone plenty of intelligent organism in the universe. ... For all of the microbes tested, oxidation rates increased as water temperature rose from 5° Celsius to 25°C. At temperatures of 30°C and higher, oxidation rates dropped substantially. When the water temperature rose to 55°C, the photoferrotrophs continued to oxidize iron but were eventually incapacitated: Even after temperature returned to 25°C, the microbes had stopped oxidizing iron and didn't restart. Similarly, the microbes probably wouldn't survive prolonged exposure to waters spewing from hydrothermal vents or volcanic seamounts. @Jeddy_Mctedder: Agreed, modulo type of multicellularity. Multicellularity has evolved many times in bacteria (cyanobacteria, diverse types of fruit bodies) but complex multicellularity depends on the energetics of mitochondria (Lane's energy theory for eukaryotes). It is unclear how often endosymbiosis occur in bacteria. But we have observations of such. On language capable intelligence, if you ask most biologists, it is the same story. It is considered a once off trait, like the trunk of Elephantids. Thank you, that is a good question! The researchers argue for seasons, simply because it is consistent with the banding. Certainly Earth had an axial tilt, though the closer Moon should affect its degree. Torbjorn, you left out the time variable. Hypothetical aliens observing the Earth from its formation would spend nearly all of their time seeing nothing like the intelligence exibited by Homo sapiens or our closer hominid cousins. Earth only rarely, briefly, exhibits that sort of intelligence. It exhibits tool-using, agricultural civilizations even less. As for civilizations capable of sending radio signals to the stars... well, that's a very very tiny portion of the time Earth has been a going concern. The time element is significant to any ad-hoc estimation of what's out there in the wider universe. Even if it is true that the odds of a Goldilocks Zone planet giving rise to intelligent beings is large - which I, myself doubt - the odds that we'll ever notice contemporaneous intelligences other than our own, such as it is, is pretty darned low. Still, I'm holding out hope that we might one day detect a Dyson Sphere. It's a long shot, but how glorious if it happens! @Urqelt: I didn't discuss the Fermi question at all. Personally I consider it too unconstrained to be testable. For example of an unobservable pathway, natural migration would be to the Oort clouds, and then radio silent as the biospheres disperse and colonize individually. If you ask most biologists, language capable intelligence is like the trunk of Elephantids, a rare trait. Thank you for your contributions Torbjorn. I always gain knowledge reading your posts here. I haven't looked into it, and especially not here where I do not yet vote, but sometime last year it seems I gained a systematic down-voter everywhere I go. No threats (yet) as I hear can happen, just that likely shrink problem as you intuit. We'll see if this sets him (most likely guys, AFAIU) off. I should add that systematic down-voting is easy to identify on WP driven sites. I dunno about here. Agreed - Torbjorn, your comments are generally excellent. To find who rated a comment, click on the commenter's name (beside the first line of the comment). Then click on 'Activity' (near the top of the screen). This shows the names who have rated recent comments by that commenter, and the average rating for each comment. When there is only one person rating a comment, this identifies that person and their rating. I should add that systematic down-voting is easy to identify on WP driven sites. Just drop them a line if someone is systematically downvoting and they'll mostly remove the votes - and sometimes even the voter if it's just a voting sockpuppet. These guys put in hours/days of effort to seek out one person's posts and downvote - but it's gone at one stroke. Which is sort of gratifying when you think about it. over time the sand turned to rock and preserved the bacterial mats and structures such as MISS. A problem here to consider is this - how long did it take for the sand to turn to rock versus how long will the bacterial mats and structures last to be encased and preserved within the rock? Given what we know of organic matter, deterioration sets in pretty quickly, so what was the process for this encapsulation that in rock? Furthermore, just how did they determine the age of the SEDIMENTARY rock since it isn't original volcanic material[supposedly]? What metric was used to judge the age of the rock? And now to the "no thanks, anti-scientist". Creationists shouldn't comment on science, it is hilarious and makes deconverts from religion, see Dawkins's Convert's Corner. How fossils comes to be, taphonomy, isn't a new science. And to ask for this specific process, which was described in the post, is showing how much the science means to denialists. They are only bothered by its existence, not what it means. Neither is dating sediments new. Look it up on Wikipedia or any other encyclopedia for an intro, or study it at university if it means more than that for you.